by the Shakespeare Theatre Company at Sidney Harman Hall on Thursday, 4/9/09. Through a special package deal, we've secured Lower Level Orchestra Seats and a condensed DC Greek session of the wildly popular Acting for Business Professionals Icebreaker/Workshop for only $35. Can't make it to the workshop? Get tickets for Ion for only $20 (regular price is $67.50). A cocktail reception will follow the performance. 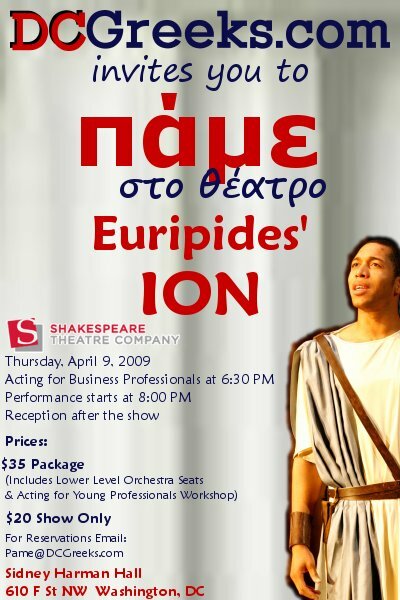 To make reservations please contact the Shakespeare Theatre Box Office at 202-547-1122 and mention DCGreeks.com to take advantage of this special offer. If you wish to participate in the Acting for Business Professionals Workshop, please purchase your tickets by 5 PM on Wednesday, 4/8/09, so we can get an accurate headcount. For more info, please email pame@DCGreeks.com. Read a review of the play by DCGreeks.com. In Ion, the Greek playwright Euripides crafts a remarkable romance of loss and reconciliation. Abandoned by his parents, Ion grows up as an orphan at Apollo’s temple. But when his mother appears in search of a prophecy, Ion must confront both his painful past and his unexpected destiny. Euripides’ plot twists and turns with jealousy and revenge before culminating in a reunion scene of deep tenderness and pathos. Ethan McSweeny returns to direct his second Greek tragedy for STC, after his “stunning … acutely theatrical” production of The Persians in 2006 (The Washington Post). He will direct the American premiere of David Lan’s new version, which captures the rich beauty of this neglected masterpiece.